A brand new project, built to bring out the influences and back-grounds of each component in the direction of a musical expression but innovative. The band represents a north/south parallel from Sweden, via Italy and Tunisia closes in Algeria, a trait d'union of various cultures that cross different cultural/artistic boundaries, but at the same time similar for passion, interest, vitality. 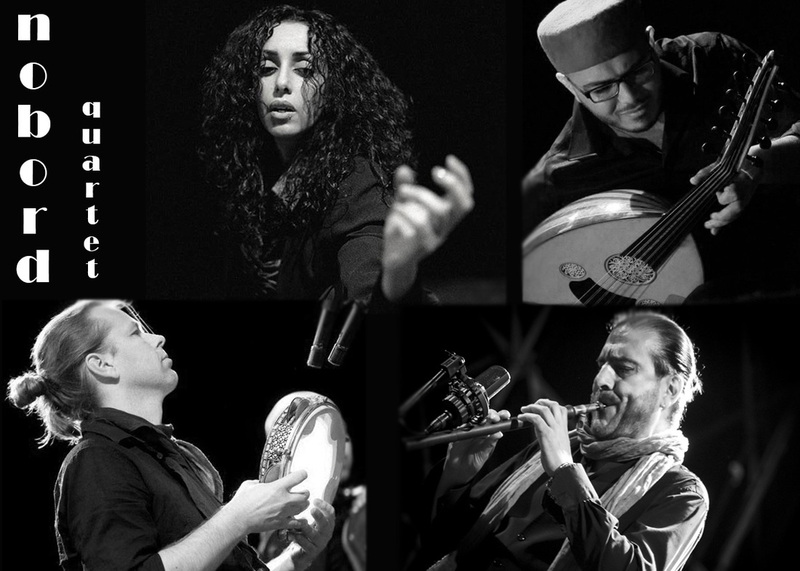 Karima Nayt , acclaimed artist Algerian, Amine M'Raihi, Tunisian oud musician from Amine & Hamza duo, Maurizio Camardi, famous musician and composer, a leading name in the world and italian jazz, and Fredrick Gille, passionate Swedish percussionist, forms Nobord Quartet. Music, art , dance and different genres from pop to world music, through jazz and ethnic music, characterizes this ambitious project that is taking place and is developing without borders ... no -borders ... NOBORD! 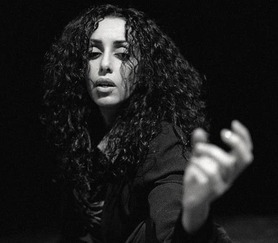 Since she left Cairo in 2007 Karima has worked mostly in Europe, participating in different dance productions and recording her long-awaited solo-album Quoi d’Autre? which was produced in Sweden and won the prize for best Cd of 2012 at the Swedish Folk & World-music award 2013. 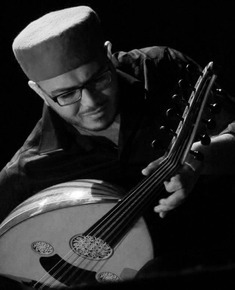 Tunisian, graduated in Oriental music that got the national award of oud and the Arabic lute, plucked string instrument like the psaltery. In spite of his young age (born in 1986) appeared with his brother Hamza in the most prestigious theaters in the Arab world in Beirut, Il Cairo, Tunis and France. He played both classical and original compositions, referring to the Arab-Andalusian music that in several areas of the Maghreb acquires special expressive and different names. In Tunisia and Libya is called Maluf and the origins of this style are to be sought Arab occupation of the Iberian Peninsula. The two brothers are developing a new technique for oud and kanoun that combines the diverse influences of oriental music, respecting the aspects of meditation and improvisation, but also introducing a dynamic expression and an independent style. He plays various saxes and flutes. He represents the italian jazz from almost 20 years and he's also an artistic director of important festival of music, literature and theater. In 1985, together with musicologist Roberto Favaro, he founds the George Gershwin Music School of Padua, of which Camardi is Artistic Director. 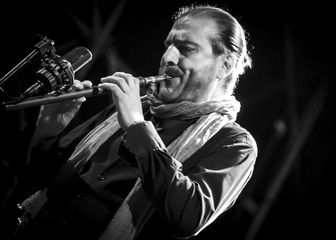 In recent years he has worked together with many jazz composers such as Paolo Fresu, Stefano Battaglia, Enrico Rava, Claudio Fasoli, Patrizio Fariselli, Paolino Dalla Porta and worked as a shift worker with personalities like Ricky Gianco, Gualtiero Bertelli and the bluesman Cooper Terry. Camardi has performed in various countries: Serbia, Slovenia, Nicaragua, Switzerland, Arabian Republic of Saharawi, Ecuador, Germany, United States, Canada. 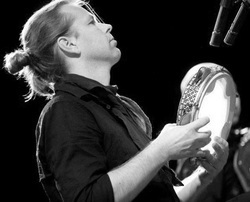 Fredrik Gille is a Swedish percussionist, he collects instruments, playing-techniques and inspiration from percussion-traditions all around the world. Originally from Eskilstuna, Sweden, Fredrik spent many years as freelance musician in Stockholm before embarking a more international career. He has a great passion for worldwide percussion-traditions and has collected a unique set of instruments - a constantly growing set-up. Learning about sounds, techniques and origins of such a variety of drums has given him a colourful spectrum of musical expressions. His playing is a palette of tasteful combinations of beautiful sounds and amazing, unexpected grooves - a typical trademark which makes him a very sought after musician. Almost constantly on tour, he takes every opportunity to meet and learn from local musicians and find new drums for his collection. Fredrik has played with groups and artists from all over the world, among just a few: Väsen (Sweden) Bazar Blå (Sweden) Radio Tarifa (Spain) Andreas Vollenweider (Switzerland) Amine & Hamza (Tunisia) Alfredo Lagos (Spain) Mich Gerber (Switzerland) Karima Nayt (Algeria) Fathy Salama (Egypt) Sofia Karlsson (Sweden) Blau (Switzerland) Jienat (Norway) as well as dance-companies Flamencos en Route (Switzerland) and ÖffÖff (Switzerland).